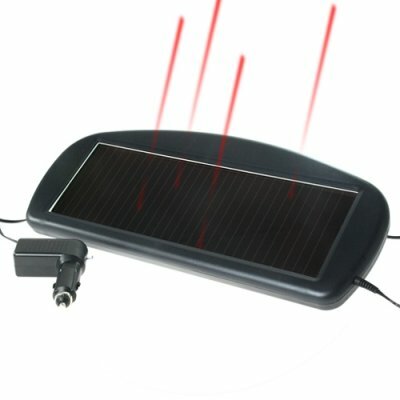 Successfully Added Solar Auto Battery Charger to your Shopping Cart. Solar Panel Charger for recharging vehicle battery. This trickle charge solar panel is designed to be placed on the dashboard of your vehicle to keep your battery freshly charged while you are away on long trips. Ideal for anyone who has to go on a long overseas trip and wants to come back to their car and not have to worry about if it will start or not. The peace of mind this gives to people who often have to leave their cars in airport parking lots is priceless. The panel can either be connected directly to a 12V battery or into a car cigarette lighter. Can also be used for RV vehicles and boats. The CVSCE-7401 is only available from your source for wholesale direct from China electronic products, Chinavasion. Leave your car in the long term parking lot; it will be ready to start when you get back! I am really impress with this, its great i had a check on it and its just great. It works fine and it charges my iphone upto 85% .its sleek . And economical product. it could have more than one usage for use in garage to recharge car bettery for standby electric generator for hold hold during electricity black out.